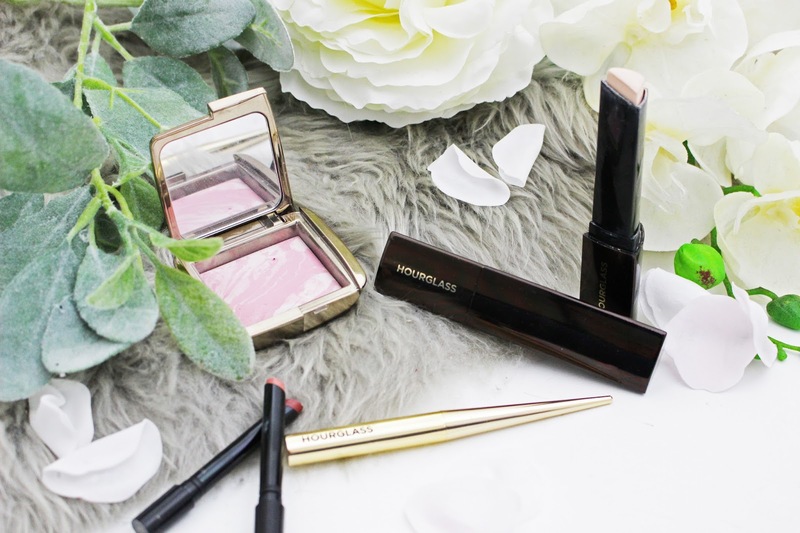 When I was first starting out with my blog and watching the likes of Fleur De Force and Tanya Burr, I would always watch their YouTube Sephora hauls and makeup tutorials and see them using these beautiful products from brands like Hourglass. Seeing as though I was a 19 year-old University student, there was no chance that I would be able to afford any products from such a high-end brand (I remember it took me two months just to get enough money to buy an Urban Decay palette). So, a £30 blusher was pretty much out of the question! After saving up my Birthday money and setting aside a small portion of my student money each month, I was finally able to purchase the Ambient Lighting Edit palette (which I am still obsessed with to this day). Now as I have gotten older I have been able to buy a few more pieces from Hourglass! 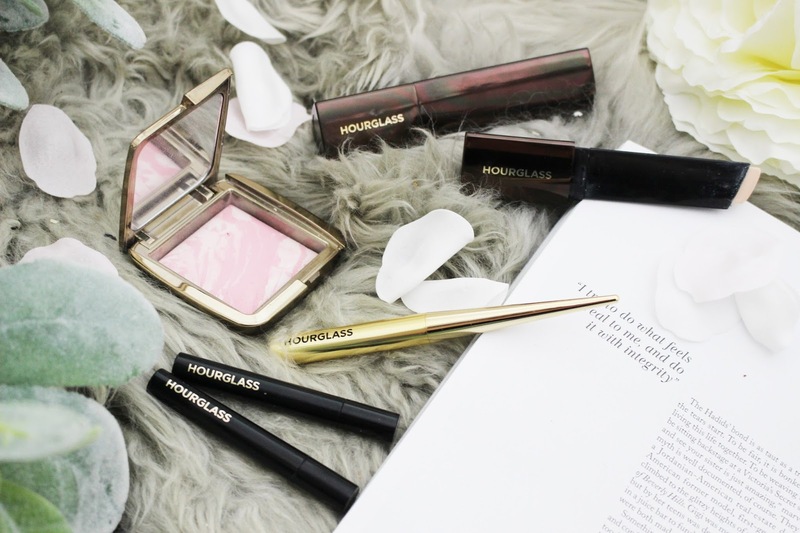 Hourglass is a brand that is ridiculously expensive and yes the packaging is stunning - plus it looks amazing on any dressing table - but I was never convinced that it was truly worth the huge price tag. I will admit I have not purchased loads of products from this brand because it is expensive and there are other products, from other brands, that I am desperate to try out for myself and review on this blog. However, I do have a few products and some I purchased myself and others were Christmas gifts from family and friends, but I have managed to pick a few of my must-have items that I absolutely love to use all the time. Choosing three products was not very difficult as I probably only have six Hourglass products in my collection (it would have been a lot harder to choose just three if it was Anastasia Beverly Hills or Urban Decay). But, I have picked three products that I truly believe are worth the price tag and they are products that I truly love and some I have even repurchased. Like with any brand I have tried some products that just did not work for me but I feel like these three products will work no matter what skin type you fall under - whether you are oily, dry, normal or combination. 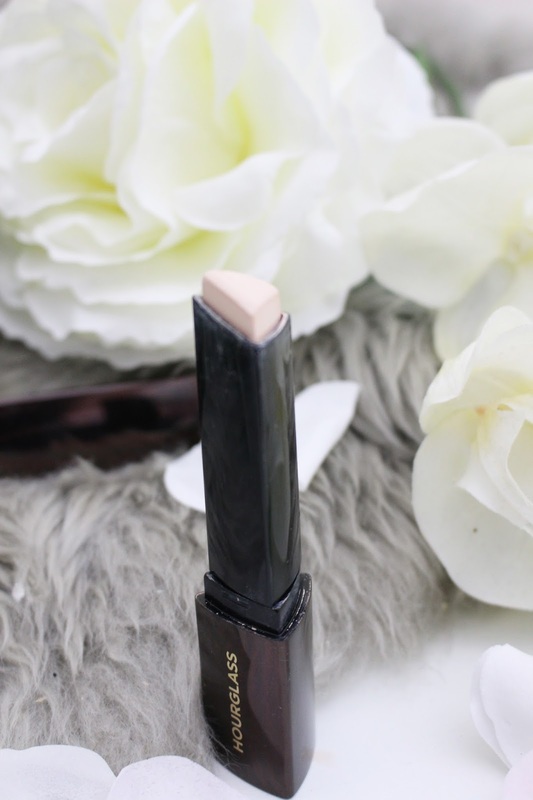 Firstly, let me talk about one of my favourite foundations of all time and that is the Vanish Seamless Finish Foundation Stick. This foundation is amazing for days when I want a full coverage foundation (like this will cover any redness, pimple or dullness on the face). When I purchased this foundation, it took me a lot of courage because of the price tag - yes, it retails for £42. I would 100% recommend going to a store and getting colour matched as it is such an investment. Luckily, I ordered online and got the correct shade for me (although I did also order the lightest shade to use as a highlighter and to lighten the foundation in the Winter. The coverage is insane with this foundation and it doesn't feel heavy on the skin. It is also so easy to apply, although you can get a bit carried away and put too many stripes on your face and then it won't look natural. With this foundation, less is more! I have also used this as a concealer and it works so well to cover up any dark circles. This is probably my favourite foundation of all time and is the foundation I wear to special occasions because my skin always looks flawless when I wear it. I don't use this that often anymore because it is so expensive but I have repurchased my shade and I am trying to not use it too much as I want to save it for days when I want my skin to look prefect (especially in photos)! I remember so many YouTubers talking about the Ambient Lighting Blush a couple of years ago and thinking I want one of them in my collection and since having it I can understand why so many people talked about it. I only have one shade as it is £32 and that is expensive for the size of the blush (you can get a palette of 8 blushes from Makeup Revolution for £10). But this one from Hourglass just feels so luxurious and just gives the most beautiful flush to the cheeks. My blush is in the shade Ethereal Glow, and it is a beautiful soft baby pink with a slight highlight soft pink shade marbles throughout. This blush is not in-your-face but just gives a subtle flush that looks beautiful on its own or as a blush topper. 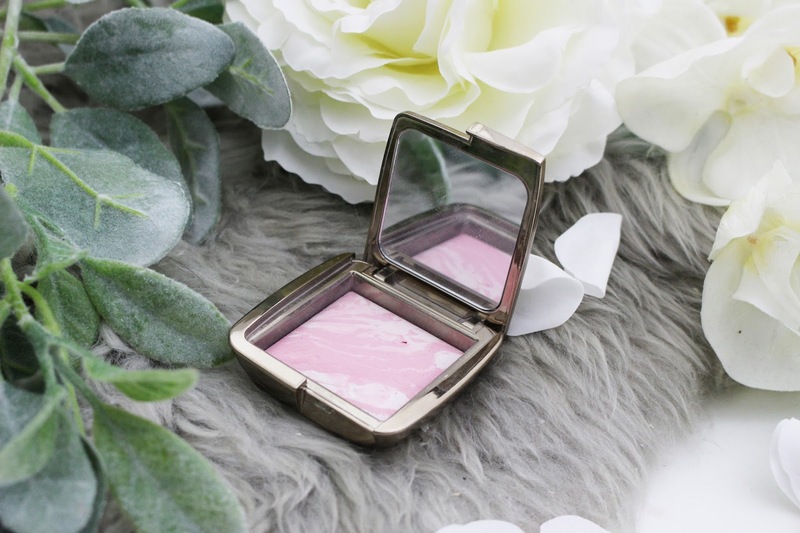 This is the blush I reach for when I want a more natural makeup look and when I don't want an intense highlight as it does give a subtle glow to the cheeks without being blinding. I am definitely thinking of buying a deeper shade of pink to see if that is more intense and they just melt into the skin when applied (they don't look patchy or too intense). These are stunning blushers! Finally, a product that I have worn so much since I received them for Christmas is the Hourglass Confession Ultra Slim Refillable Lipsticks. I actually received the Holiday trio set but you can buy them individually and the concept of these lipsticks are so unique and amazing. All you have to do is buy one lipstick for £28 and then instead of buying more at the same price you can just buy the refills for £18 in any colour that you like. Therefore, you have one lipstick bullet and you can interchange the refills - my only little criticism is that I am not really sure where to store all the refills as they are quite small but this is not a major problem. The lipsticks themselves are so creamy and pigmented, plus they last such a long time. I will often wear a lip liner underneath (so they last even longer) but I find that I can wear these for 4-6 hours without having to reapply, although they don't last as long if you eat and drink with it on. These lipsticks are stunning and I love how they are so different from any other lipstick that I own and they take up hardly any space. These will be perfect for travelling, as instead of taking a few bulky lipsticks you can take one of the bullets and a whole load of lipstick refills without worrying about your makeup bag being too bulky or weighing too much. I am definitely going to be buying some more shades very soon as they have been my go-to lipstick at the moment and there are so many shades in the collection. I know this was a really short post but I absolutely love these Hourglass products and I wanted to share them with you. I also want to do more blog posts like this where I highlight a few products that I really think are worth the price from different brands. 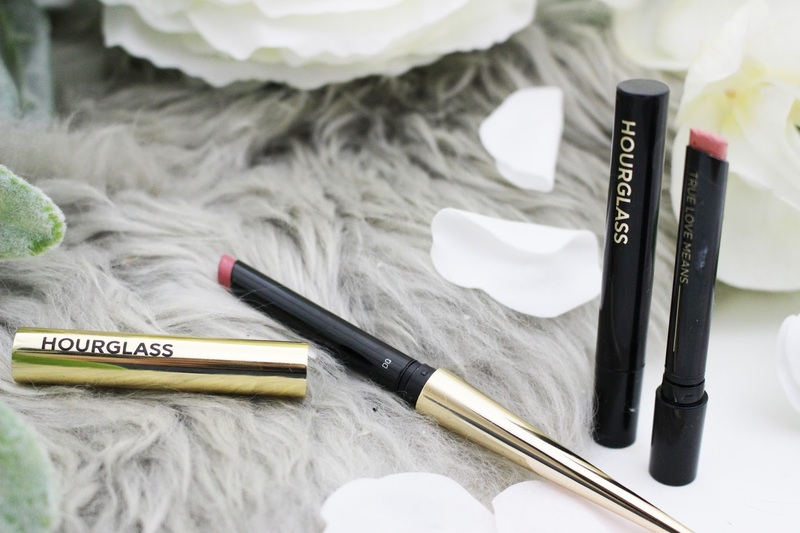 Let me know if you have tried any of these products and if there are any other Hourglass products that are worth the price tag? Also let me know in the comments what brands you would like to see a similar post from - it can be high-end or drugstore!